Clorox germicidal wipe with bleach which is effective against a wide range of microorganisms and engineered to meet the disinfecting needs of today's busy healthcare professionals. 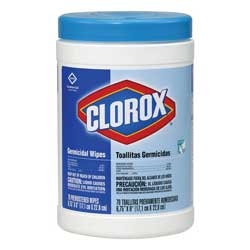 Clorox Germicidal Wipes provide real-world kill and contact times, and convenient application methods and a one-year shelf-stable, bleach based formula. 1 minute contact kills Rotalvirus, E. coli, Staphylococcus aureus, and HIV type 1 EPA Registered product. 1:10 bleach solution recommended by the CDC in a ready to use formula. Comes 70 wipes per canister.